I just started reading southern gothic novels this fall and loved them. When I heard about Compulsion and saw that beyond beautiful cover I got super excited and had very high expectations for it, which where immediately met! The book does start off a little slow. Not as in nothing is happening or that its boring, there is just a lot of background information you need to know and characters to be introduced to. Once you get past that part I promise the book will pull you right in. The pace picks up and lots of intrigue, mystery, and romance start to happen. I loved the characters in this book. Barrie was a phenomenal main character. She was very strong and determined to fix things on her own. She was also very witty. I immediately wanted to be friends with her. I also found her very relatable and likeable. I also ended up really liking her Aunt Pru. She was very real. She had her own struggles but was always trying to help Barrie too. I also found her kind of quirky which added a uniqueness to her. I ended up really liking the relationship they grew to have. And don't even get me started on Eight. He is definite swoon material. He was a southern gentleman and always trying to help Barrie no matter what but he also had a witty side like Barrie that made them work perfectly together. That leads me perfectly into talking about the books romance. Barrie and Eight were excellent together. There was so much fun and cute witty banter between them. Barrie always wanted Eight but she always gave him a hard time keeping him on his toes. They worked so well together in a romantic sense but they were also just a great team. They do fall for each other at the beginning of the book but it does not feel like insta-love. That also allowed you to watch them together and see their romance bud over the whole story, which I loved. I thought Boone incorporated the magical part of the plot in well. There is a magical element to the family curses but it does not take the lead in the story. It is fully described and feels very complete but it was still more in the background. I really liked this because it was a really interesting fun twist to the novel but it did not take over the book and plot. There is also a mystery incorporated into the story that I had no idea was going to happen. It added more suspense to the novel and I really enjoyed it. This book had it all for me. A southern gothic with curses, generations-old family feud, mystery, magic, and a compelling romance. 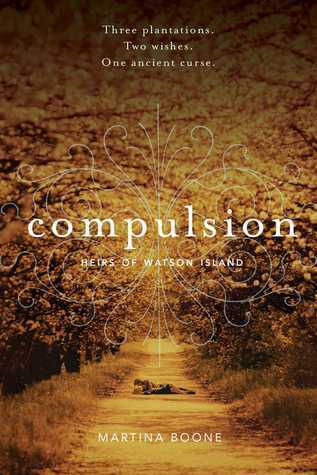 If you like any of the things I just listed I highly recommend giving Compulsion a try. I am now early awaiting the sequel Persuasion which is excepted to release in October 2015. OOOH. I've seen this floating around for SO LONG but I never got around to it--but now I'm pretty sure I'm going to have to. ;D AND THE MAGICAL ASPECT SOUNDS SO AWESOME! It is definitely worth the read! I have never read anything like it before.